Mill Hill works in partnership with Los Pipitos, a charity organisation which provides assistance to parents with children of varying disabilities. Sadly many of the disabilities that we see in Nicaragua arise from poor neo and post natal care. Nicaragua is the second poorest country after Haiti in the Americas and the public hospitals are often ill equipped and understaffed. Our project is based in a Los Pipitos centre in Jinotepe, approximately an hour’s drive from Managua. 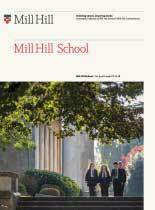 Money is raised by pupils at Mill Hill through cake sales, mufti clothes days and profits from pupil led concerts.